Mike Ellis, a sixth grade science teacher at Ivy Academy, Dipa Field, with Chattanooga Center for the Arts, and Rebecca Westbrook-Toker, a teacher at Wauhatchie Forest School, sample the water in South Chickamauga Creek Monday, July 9, 2018 in Graysville, Georgia. During the week-long workshop, teachers are learning about chemical monitoring and macroinvertibrate monitoring as well as sampling in South Chickamauga Creek. Dressed in waders, some in floppy hats and ball caps or doused in bug spray, nine Hamilton County teachers stood almost knee deep in the South Chickamauga Creek on Monday afternoon, kicking their feet toward a piece of green mesh stretched across the width of the creek. Directed by staff and scientists from the Tennessee Aquarium and its Conservation Institute, the teachers were trying to guide the fish in the stream toward the mesh so they could trap them to briefly view what species they might find. 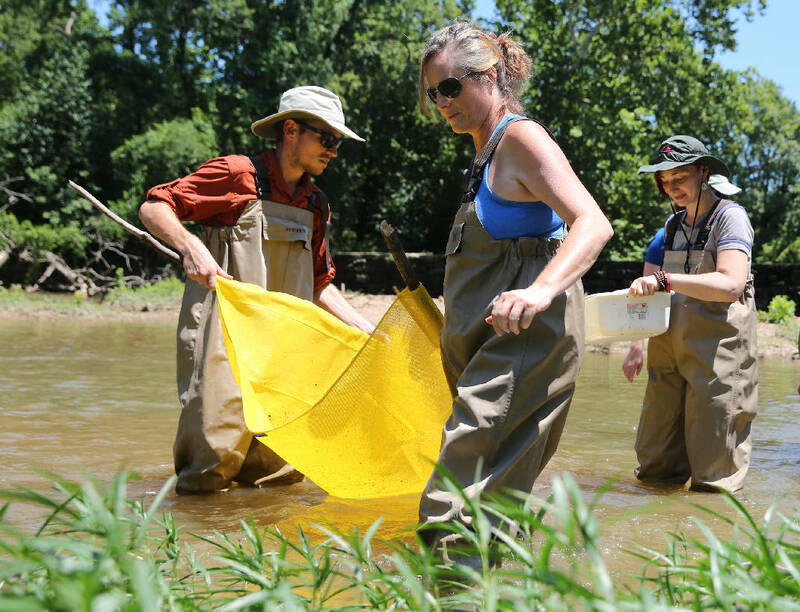 The educators, from a variety of schools — public, private and even home schools and alternatives — are part of the institute's second annual River Teachers Workshop. Their goal this week during the grant- funded, five-day workshop is to learn how best to bring lessons focused on water and natural, local ecosystems to their classrooms. "All the outreach and education of the institute is aimed at how can we reach as many children as possible," said Hayley Wise, watershed coordinator for the Tennessee Aquarium. "How we can bring freshwater and aquatics into our classrooms, and we want to give these teachers the confidence and skills to do that." Starting with Monday's water sampling activities and work to become certified in Georgia's Adopt-A-Stream volunteer water quality program, educators will spend the week snorkeling, kayaking, becoming certified in Project Wet — a water-focused curriculum — and visiting the Chickamauga Battlefield, the Lookout Conservancy and more. Many teachers spend their summers participating in professional development opportunities to expand their learning and skills in the classroom, and the educators participating in the workshop said they were eager for that and more. "I'm really excited to have the opportunity to work with the Tennessee Aquarium because I want to get my high school kids, in chemistry and biology, out in the field," said Tekla Currie, the high school science teacher at Veritas Classical Schools, a hybrid home school/private school organization based in Atlanta. Currie was also excited to work with educators from across Hamilton County that she might not have encountered otherwise. Rebecca Westbrook Toker, whose enthusiasm was evident as she plunged into the creek alongside Mike Ellis, a new teacher at Ivy Academy, echoed Currie's thoughts. "I'm just hoping to get out in nature and see how I can bring these lessons to my kids," she said. Westbrook Toker is a teacher at the new Wauhatchie Forest School campus opening at Reflection Riding Arboretum and Nature Center this fall. The school, which is modeled after an outdoor curriculum that originated in Germany, will be "citizen science based," Westbrook Toker said. "It's focused on ways that individuals can contribute to scientific knowledge," she said. "And showing students that science is not just about lab coats and writing down observations, but is everywhere." The River Teachers workshop provides activities and models ways that teachers can do just that. While wading in the creek, educators pulled water samples to test for dissolved oxygen and measure pH levels — activities they can easily do alongside their students, said aquarium educator Sammi Eubanks. "Through the program we are able to establish and sustain relationships with these teachers," Eubanks said. Institute staff maintained contact with last year's workshop participants, according to Wise and Eubanks. Staff members visited the teachers' classrooms and provided more activities or support as teachers became more confident in their curriculum choices. At the end of this week, each educator will receive the same water testing kit they learned to use Monday, so they can perform the same activity with their students. "We are able to see how their testing is going through the year," Eubanks said, of being able to provide the kits through grant funds. Aquarium President and CEO Keith Sanford said part of the program is helping teachers and their students realize the water sources they have at their doorsteps. "Many schools have water somewhere near to the school," Sanford said. But not all schools know how to incorporate such natural resources into their curriculum, and some science curriculum even ends up focusing on marine life and oceans. "The aquarium's 501c3 status is based on education and how we reach the community, so the more we can get teachers together to help them teach better science in the classroom the better," he added. Last month, a group of elementary school teachers participated in the summer's first River Teacher workshop. Throughout the school year, the aquarium and the institute also provide day-long workshops for teachers, reaching as many as 200 teachers a year, Wise said.